The NHL’s goaltending market is heating up. As TSN Hockey Insider Darren Dreger reported during Tuesday’s Insider Trading, St. Louis Blues GM Doug Armstrong feels like he has little choice but to search for a solution in goal. Jake Allen isn’t cutting it with an .896 save percentage behind a team picked to be a division contender. The Blues are reportedly sniffing around Detroit’s Jimmy Howard, but they may not be alone. The Pittsburgh Penguins are very much in ‘win now’ mode, are believed to have interest, and, unlike the Blues, the Pens have a first-round pick to dangle. In Philadelphia, it’s the same old story. The Flyers used five goaltenders in the first 23 games of the season. They rank dead last in save percentage. Brian Elliott and Michal Neuvirth can no longer be counted on to stay healthy. Flyers president Paul Holmgren, now in charge of hockey operations until a replacement is found for fired GM Ron Hextall, said Tuesday that he will personally look for a goaltender in the short-term. The Flyers need a bridge to Carter Hart, who has arguably had the best career ever from a Canadian major junior goaltender. Scoop: At this point, it seems unlikely that the Columbus Blue Jackets would move the two-time Vezina Trophy winner for any price, no matter how cold the negotiations have been between these two sides on an extension. The Blue Jackets have never won a playoff series and they’re on a mission – with a wide-open Metropolitan – to take a run while Bobrovsky and Artemi Panarin are in the fold. Nonetheless, ‘Bob’ is a name to keep an eye on, if not for the trade market then certainly free agency. Bobrovsky is believed to be seeking a seven-year deal approaching Carey Price’s cap hit of $10.5 million. Some are curious whether the Flyers, amid their recent regime change, will take a run at bringing Bobrovsky back. He doesn’t seem to make sense in Philadelphia on a monster deal with Hart waiting in the wings, but you never know. 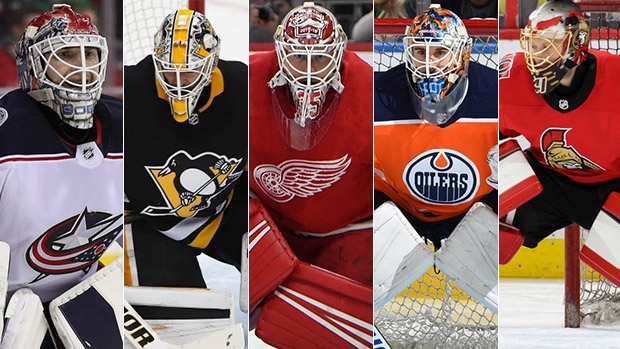 Scoop: After capturing two Stanley Cups in his first two years, something no other goaltender in the history of the NHL has done, it would be shocking that Murray appears on this list. But it’s fair to wonder now whether Murray’s inconsistency and injuries have worn the Penguins’ patience thin. Murray is still incredibly young for a goalie, but he’s yet to play 50 games in any regular season and he won’t hit that mark this year. His ailments during his four-year career: two concussions, a broken hand, a head injury, an upper-body injury and now he’s sidelined with a lower-body injury. When he’s been healthy, Murray has just a .901 save percentage over his last two seasons. The tangle, of course, is that when it matters most Murray has been lights-out. That’s tough to reconcile, but the Penguins have been pleased with what they’ve gotten from Tristan Jarry and Casey DeSmith in the short-term. Scoop: Howard is single-handedly standing in the way of a complete Red Wings rebuild. He has pulled the Detroit out of the Eastern Conference basement with a 5-1-1 mark and .931 save percentage in November. Their record could be even better, as the Wings lost four games in October when Howard only allowed two goals against. GM Ken Holland tried to move Howard two years ago, but the term on his contract made him a difficult sell. Now Holland is believed to be holding out in an attempt to get a first-round pick in return, a price he may well fetch between now and the Feb. 25 deadline. Sometimes the best trades are the one you don’t make. Scoop: Like Murray, it would’ve been unfathomable 18 months ago that Talbot would be available. The Oilers’ workhorse appeared to be their long-term answer after a Vezina-quality season that led them to Game 7 of the second round in 2017. Now, Talbot seems like a netminder in need of a classic change of scenery. New coach Ken Hitchcock seemed to send a strong message about Talbot’s future role when he started Mikko Koskinen in his first two games behind the bench. Talbot’s numbers are a bit clouded behind the lack of support in front of him and the high-danger mistakes the Oilers allow on a nightly basis, but that doesn’t also explain why Koskinen has been seemingly unaffected with a .923 save percentage. The Oilers aren’t in a hurry to move Talbot, but his availability will come into clearer focus as February approaches. Scoop: Two things are keeping Anderson in Ottawa for the time being: the extra year remaining on his contract and the fact that the Sens do not have any other viable NHL help behind him. Mike Condon has struggled mightily. Filip Gustavsson, 20, is the heir apparent, but he has also struggled so far in AHL Belleville. Is there a contender that would make a play for Anderson as insurance if the Senators were to eat some salary? It’s possible. Anderson has been significantly better than his stats would indicate. The Sens allow 38 shots per game, last in the NHL, and have given up 200 more shots than the average NHL team through the first quarter of the season.